Canadian Language Schools: The minimum requirement for a teaching job at a Canadian language school is TESL Canada Professional Standard 1 certification. 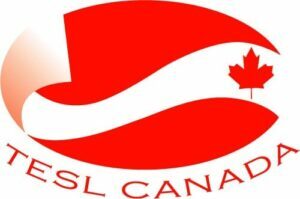 International Jobs: TESL Canada Professional Standard 1 is equivalent to CELTA or Trinity CertTESOL because it requires 120 hours of training and a Practicum module, so TESL Canada is accepted for professional teaching jobs anywhere in the world. LINC, University or College, IELTS Teaching Jobs: TESL Canada Professional Standard 2 certification will give you the credentials you need to pursue the best teaching positions in Canada and abroad. Coventry House International-OnTESOL Has Been an Approved TESL Canada Course Provider Since 2003! The online 250-hour TESOL Diploma program offered by Coventry House International is recognized by TESL Canada for their Professional Standard 2 accreditation on completion of a separate 50-hour Practicum. The online Advanced 120-hour TESOL Certificate program offered by Coventry House International-OnTESOL is recognized by TESL Canada for their Professional Standard 1 accreditation on completion of a separate 20-hour Practicum. Save up to $300! Get 50% OFF on all specialist courses when you enroll in one of our TESL Canada programs. Upgrade your skills and credentials with the TEYL, Teaching Business English, and Teaching IELTS specialists! New ESL teachers: Get the best level of training you can get from the very beginning! 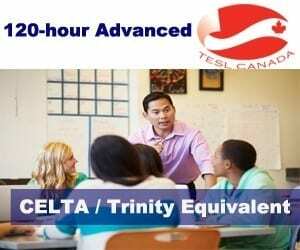 A TESL Canada Standard 1 program is equivalent to CELTA and Trinity CertTESOL wordlwide. TESL Canada accreditation is open to native speakers from Canada, USA, UK, Ireland, South Africa, Australia, and New Zealand. Non-native speakers who have a high level of English language proficiency may also apply. Experienced ESL teachers: Upgrade your credentials and pursue greater career opportunities! Study online and save on the Practicum fee by completing it at the school you work at. Experienced Canadian teachers returning from teaching abroad: Get the credentials you need to teach English in Canada. You can start the program online and finish while you fulfill your contract abroad. You may also complete the Practicum abroad if the supervising teacher and classes meet the requirements. Canadian ESL teachers going abroad: Get the training and credentials you need to teach English in Canada and abroad. Go abroad with an online TESOL certificate or TESOL Diploma and complete the Practicum when you want to become eligible for TESL Canada accreditation! There isn’t a deadline to complete the Practicum, so you can take it before leaving, while teaching abroad, or after returning home. University degree: Students without a university degree can still enroll in the Advanced 120-hour TESOL Certificate program or the 250-hour TESOL Diploma and receive the certificate awarded by Coventry House International-Ontesol upon successful completion of the program, but they are informed that they need to complete an undergraduate degree from Canada or its equivalency before applying for TESL Canada Professional Standard 2 certification. Candidates who completed their degree outside Canada can enroll in a TESL Canada recognized program, but they are informed that they must obtain the Canadian equivalency document before applying for TESL Canada accreditation. Non-native speakers who have not completed a university degree in an English speaking country are eligible to take the Advanced TESOL Certificate or TESOL Diploma program, but they are informed that they must obtain a valid English Proficiency Score. From October 1st, 2015 onward TESL Canada will accept only IELTS Academic (Overall 7 with a minimum of 7 in each skill area) and TOEFL iBT (Overall 101 with a minimum of 23 in Listening, 24 in Reading, 27 in Speaking and 27 in Writing). The Practicum MUST be completed to be eligible for TESL Canada accreditation. Our TESL Canada-Recognized Online Courses Come with Video Tutorials and Recorded ESL Classes! Below you will find sample videos on Communicative Language Teaching, using authentic material, teaching integrated skills, and teaching grammar.